This first sampling of C&S readers and players is presented with due apologies for technical and performance drawbacks. Most of the selections date from about 1985 and were recorded by the performers in their own living rooms and garages, often on the most primitive equipment imaginable; so performances were originally chosen by John Townley on tha basis of originality and variety rather than slickness, technical proficiency, or recording quality. 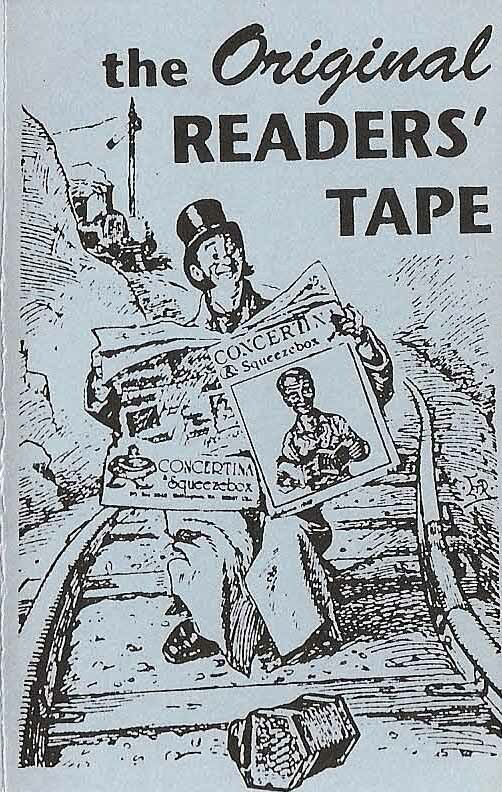 This tape is a cottage industry production, proceeds from the sale of which support the publication of C&S magazine. Be warned! This tape may delight or infuriate, but we hope that, rough as it is, it will inspire more contributions to future volumes of musical exchange and development of free reed styles. Send your contribution in for our next incredible.effort, Revenge of Readers’ Tape! 1. Nonesuch; Mariide & The Free Lunch Conspiracy (flute, English concertina, guitar, bass, mandolin). 2. Pavan: The Earl of Salisbury: John Winship (Jeffries C/C Anglo Concertina). 3. Reaphook & Sickle: Charles IJirich (Anglo Concertina & synthesiser). 5. Various Tunes:Alan Lochead & Co. (English & Anglo Concertinas). 6. Scattery Island Slide:Joel Cowan (Chemnitzer Concertina). 8. Icicle Joe the Eskimo: Larry Wilson (30-key Dipper Anglo Concertina). 10. Wooden Heart I Sasha Come Home: Ibid. 11. Hamilton House: John Seibart (McCann System Duet Concertina). 12. The Nutting Girl: Ibid. 13. The Battle of Augrim I O’Keefe’s: Ibid. 14. Kerry Polka I The Cooraclare: Joel Cowan (Chemnitzer Concertina). 1. Cuckoo’s Nest: Larry Cole & John Townley (English Concertina & guitar). 2. Old Tom of Oxford:Ibid. (Hohner Melodeon). 3. As I Roved Out: Lisa Moscatiello & Wendy Morrison (English Concertina). 5. The Stream of Cats: Wendy Morrison & Co.
6. Cincinnati: “Dr. Jack” Wilson (Hohner Preciosa Melodeon). 7. A Carol (Rudyard Kipling): John Townley (Wheatstone English Concertina). 8. New York Gals: The Press Gang (with Melodeon): Cut off. WONDERFUL? HORRIBLE? EXCITING? BORING? Do better! Send your contribution to us at the above address—use a good chromium oxide tape please! Download all files for this tape (52Mb).